China is viewed favorably in just half (19 of 38) of the nations surveyed excluding China itself. Beijing’s strongest supporters are in Asia – in Malaysia (81%) and Pakistan (81%) – and in the African nations of Kenya (78%), Senegal (77%) and Nigeria (76%). There is also a high positive opinion of China in Latin American nations that have become large commodity exporters to Beijing, such as Venezuela (71%), Brazil (65%) and Chile (62%). This favorable opinion toward the People’s Republic is not shared everywhere, however. Only 28% of Germans and Italians and 37% of Americans hold a favorable view of China. But it is in Japan where, more than anywhere else, antipathy toward China is striking. Just 5% of Japanese have a favorable opinion of China. There has not been much change in views of China in most nations for which comparable 2007 survey data exist. 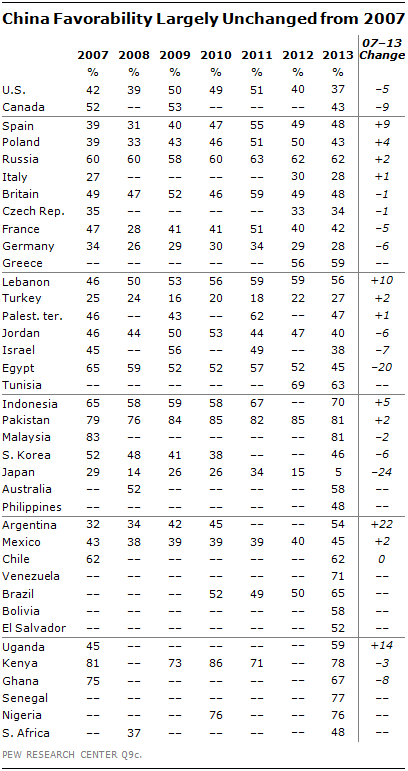 The greatest improvements in China’s image have been in Argentina, up 22 percentage points, and Uganda, up 14 points. The most significant deterioration in attitudes toward China has occurred in Japan, down 24 points, and Egypt, down 20 points over the past six years. But in much of Europe and the United States, as well as parts of the Middle East, this six-year trend line masks a significant reversal of opinion since the peak of pro-China sentiment in those countries in 2011. In just the past two years, favorability toward China has fallen 14 percentage points in the United States, 11 points in Britain and 9 points in France. This is likely the result of unease about China as a commercial competitor, European frustration with Chinese unilateralism in foreign affairs, and American concern about the U.S. trade deficit with China and Beijing’s holding of American debt. Over that same period, favorability of China is down 15 points in the Palestinian territories, 12 points in Egypt and 11 points in Israel, where frustration with Chinese unilateralism in international affairs may have a particularly corrosive effect. Nevertheless, outright anti-China sentiment is limited. In 2013, in just 11 of the 38 nations surveyed is China actually viewed unfavorably by at least half of those surveyed. The strongest anti-China sentiment is in Japan, where 93% see the People’s Republic in a negative light, including 48% of Japanese who have a very unfavorable view of China. There are also large majorities in Germany (64%), Italy (62%) and Israel (60%) who hold negative views of China. The rise in anti-China sentiment in Germany is particularly striking. In 2006, only 33% of Germans had an unfavorable view of China. Since then, negative sentiments have risen 31 percentage points. And such unfavorable views exist despite Germany’s success exporting to China. Attitudes toward China also vary markedly by region of the world. A median of less than half of those surveyed in North America, Europe and the Middle East has a positive view of China. At the same time, a median of 72% in Africa and 58% in Asia and Latin America look favorably on China. Half or more of those surveyed in 16 of 38 nations see China as more of a partner for their country than as an enemy. This is particularly the case in Pakistan (where 82% view China as a partner). Islamabad has been the recipient of a great deal of Chinese financial assistance over the years. In addition, Malaysians (78%) view China as a partner. Publics in a number of African nations – including Senegal (78%), Kenya (77%), Nigeria (71%) and Ghana (70%) – are strongly of the view that China is a national partner. China is the second leading trading partner with Ghana and Kenya, the fourth leading trade partner with Nigeria and the fifth with Senegal. A similar sense of partnership exists in Venezuela (74%), which sells a great deal of oil to China, and Chile (62%), which sells Beijing copper. A majority or plurality in 15 nations – including a majority in the United States (58%) – see China as neither a partner nor an enemy. And only in four nations – Japan (40%), the Philippines (39%), Italy (39%) and Turkey (36%) – does a significant minority view China as an enemy of their country. There is evidence that China’s global influence, at least as measured by some aspects of Chinese soft power, is respected, especially in Africa and among the young. In some cases, though, significant portions of those people surveyed voiced no opinion. Chinese scientific and technological advances are the most widely appreciated aspect of China’s influence in both Africa (a median of 75% like such aspects of China) and Latin America (72%). 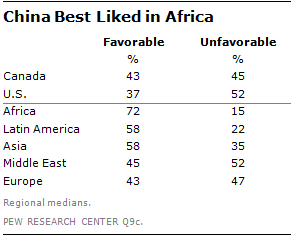 On all other measures, Africans tend to have a more positive view toward Chinese soft power than Latin Americans. Africans (a median of 59%) are particularly appreciative of Chinese ways of doing business. But the spread of Chinese ideas and customs and Chinese cultural products – such as music, movies and television – lack majority appeal in both Africa and Latin America. Science and technology are China’s most popular soft power. Majorities in all African and Latin American countries surveyed have a positive view of these attributes of Chinese influence. Fully 85% of Nigerians and 80% of Salvadorans and Venezuelans admire China’s technological and scientific advances, as do 77% of Senegalese, and 75% of Ghanaians, Kenyans and Chileans. There are several reasons why publics may admire Chinese scientific and technological success. It may be an appreciation of the great strides Chinese companies have made in branding products – such as Lenovo with computers and Huawei with mobile phones – or an understanding that many parts in laptops or tablets come from China or it may simply pick up a respect for more mundane made-in-China consumer products such as refrigerators and microwave ovens. Perhaps in admiration of China’s record of strong economic growth, perhaps because China has become a major trade and investment partner, or perhaps for other reasons, the Chinese way of doing business is particularly attractive to people in Africa. More than half of those surveyed in five of six countries admire China’s business acumen. This includes 76% of Nigerians, 68% of Kenyans and 65% of Senegalese. Only South Africans are divided on Chinese business practices, with 43% liking them and 42% disliking them. Perceptions are different in Latin America, however, where in a number of countries a high proportion of people voice no opinion about China’s way of doing business. Only in Venezuela (53%) does more than half the population admire Chinese business practices. This may be because China is Venezuela’s second-largest export market, exceeded only by the United States. And by two-to-one, Chileans (48% to 24%) like Chinese business operations, possibly reflecting the fact that China is now Chile’s main trading partner, buying nearly a quarter of Chile’s exports. But such close business ties can cut both ways. China is Brazil’s largest trading partner. Nevertheless, roughly half of Brazilians (51%) dislike China’s way of doing business. Chinese pop culture is not well liked in much of either Africa or Latin America, in part because significant portions in seven of the 13 nations surveyed have no opinion. 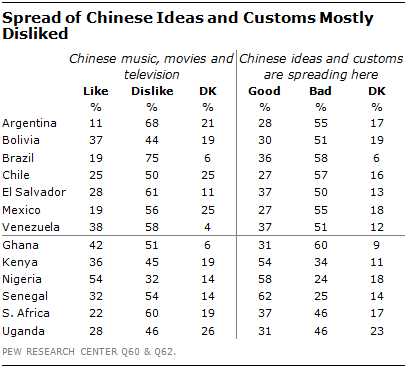 Of those who have a view, Chinese music, movies and television is disliked by majorities in six countries, including in Brazil (75%), Argentina (68%), El Salvador (61%) and South Africa (60%). Only in Nigeria (54%) do most people have an affinity for such Chinese exports. In only three of the 13 countries surveyed in Africa and Latin America – in Senegal (62%), Nigeria (58%) and Kenya (54%) – do more than half think it is good that Chinese ideas and customs are spreading in their country. Half or more of those surveyed in eight nations – all countries surveyed in Latin America and one African country – think such Chinese influence is a bad thing, including in Ghana (60%), Brazil (58%) and Chile (57%). China’s greatest global asset in the future may be its appeal among young adults around the world. In 16 of the 38 nations surveyed, younger people are significantly more likely than older people to look favorably on China. This is true in North America, in six of the nine nations surveyed in Europe and five of the seven countries in Latin America. More than three times as many young Turks as older Turks look favorably on China as do more than twice as many young Americans as older Americans. Fully 57% of those aged 18 to 29 in the United States have a positive opinion of China, compared with just 27% who hold such views among people aged 50 and older. In Poland the generational split is 59% to 35%, in Argentina 63% to 42%, in France 55% to 37%, and in Britain 58% to 42%. The pattern is reversed only in South Korea, where 58% of those aged 18 to 29 hold an unfavorable view of their neighbor, while 42% of people 50 years of age and older see China unfavorably. Certain aspects of Chinese soft power seem to be particularly appealing to the young. 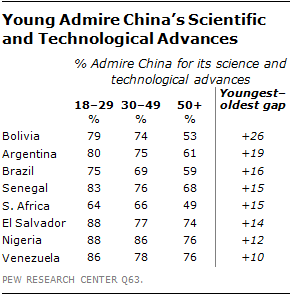 In many African and Latin American nations, it is those aged 18 to 29 who most admire China’s scientific and technological prowess. Eight-in-ten or more young adults in Nigeria, El Salvador, Venezuela, Senegal and Argentina see such advances as a positive attribute of Chinese soft power. The generation gap is particularly large in Bolivia (26 percentage points), but also in Argentina (19 points) and Brazil (16 points). Chinese pop culture fares better with the younger generation, as well. They are much more likely than older people, at least in some nations, to appreciate such Chinese soft power. 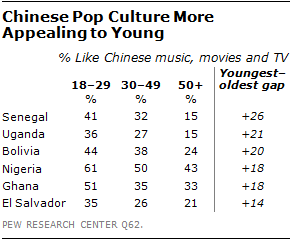 About half or more of those aged 18 to 29 in Nigeria (61%) and Ghana (51%) like Chinese music, movies and TV, as do large minorities of the young in Bolivia (44%) and Senegal (41%). In addition, the spread of Chinese ideas and customs has majority strong only among the young in Senegal (64%), Kenya (63%) and Nigeria (62%). Despite China’s general favorability around the world and its appeal to the young, half or more of those surveyed in 26 of 38 nations think that China acts unilaterally in international affairs. This concern about Beijing’s failure to consider other countries’ interests when making foreign policy decisions is particularly strong in the Asia-Pacific – in Japan (89%), South Korea (79%) and Australia (79%) – and in Europe – in Spain (85%), Italy (83%), France (83%) and Britain (82%). About half or more of those in the seven Middle Eastern nations surveyed also think China acts unilaterally. This includes 79% of Israelis, 71% of Jordanians and 68% of Turks. There is relatively less concern about this issue in the U.S. (60%). African nations – in particular strong majorities in Kenya (77%), Nigeria (70%), South Africa (67%) and Senegal (62%) – believe Beijing does consider their interests when making foreign policy decisions. Another source of recent tension in relations between China and its immediate neighbors has been a series of territorial disputes in the Asia/Pacific region. The most prominent of these is between Japan and China, which are engaged in a confrontation over what Tokyo calls the Senkaku Islands and Beijing terms the Diaoyu Islands, small uninhabited rocks in the East China Sea. In addition, the Philippines and China are embroiled in a standoff over the Scarborough Shoal in the South China Sea. Strong majorities in the Philippines (90%), Japan (82%), South Korea (77%) and Indonesia (62%) think that such territorial disputes with China are a big problem for their country. This is particularly the case in the Philippines, where 58% of Filipinos say such friction with China is a very big problem. In a related issue, many of China’s Asian-Pacific neighbors are quite troubled by Beijing’s growing military power. Nearly all Japanese (96%) and South Koreans (91%) and strong majorities of Australians (71%) and Filipinos (68%) think China’s expanding martial capabilities are bad for their country. There is far less concern in Pakistan (2%), Malaysia (20%) and Indonesia (39%). It is notable, however, that the proportion of Pakistanis, Malaysians and Indonesians who think China’s growing military power is a positive thing for their country is actually down from previous surveys. These sources of tension may help explain why the Chinese are worried about their image abroad. When asked if their country is as respected around the world as it should be or should China be more respected than it is, 56% of Chinese say their nation should be more respected.